Looking for new, different activities to help your students practice and learn the Algebraic properties? 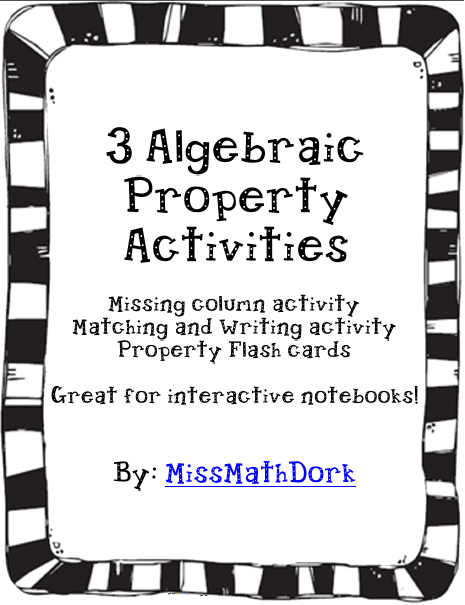 Try my Algebraic Property Bundle – 3 different Algebraic Properties bundled together in one BIG package! The first activity is perfect for an interactive notebook, or a tiered activity. Fill in the missing sections of the property columns. There are 3 versions of the 1-missing piece of information template, 3 versions of the 2-missing pieces of information template and a sample answer key. The second activity is the perfect blend of math, matching, and writing. Students match the property, an example, and the property definition and then explain what the relationship between the three pieces is. Great for an interactive notebook – could even be used as a summative assessment. Easily tiered by giving students 1 or 2 pieces of information. The third activity has students matching 10 properties to 10 examples. After matching, students use the cards to create flashcards that they can use to study from. Includes directions on how to make a simple fold-able to keep the “known” properties separate from the “need to know” properties. Great activities that have been classroom tested and have had positive results. Categories: mental math and patterns, functions and algebra.